Abandoned by God to indulge in every whim we hurtle head long towards catastrophe and destruction. No super hero Jesus or Mohammed can save us now. David Price's current work incorporates the ancient art of copper plate etching, a slow and laborious process with remarkably detailed results. The intensity of his work draws upon our history of endurance and fear of the unknown, and reworks these into a narrative study of the human condition. 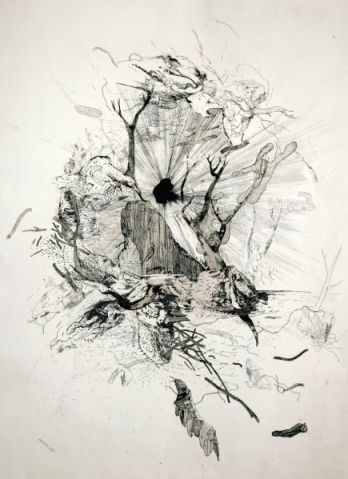 Biography: David Price, born in Birmingham and now based in London studied Fine Art at the University of Edinburgh, before completing an MA in painting at the University of Newcastle-upon-Tyne and most recently an MA in printmaking at the Royal College of Art, London in 2009. Recent selections include the Bloomberg New Contemporaries 2009, an annual show dedicated to profiling the work of young, new and emerging artists at the start of their professional careers, launched at Cornerhouse, Manchester. Currently, David is Director of London Drawing and is Tutor at the Tate Modern, London, specialising in Drawing.